An electric bike is a bicycle, scooter, or motorcycle with an integrated electric motor for propulsion. It is either partly assisted by peddling or completely propelled through electric power. It comes in various classes, such as pedelec/pedal assist (torque sensor, cadence drive), throttle on demand (twist grip, thumb & push button), and scooter/motorcycle. Consumers use electric bikes for commutation or recreation. The global electric bikes industry has been witnessing bright opportunities, owing to government support and strict rules in favor of electric bikes. Moreover, growing consumer inclination towards use of e-bikes as an eco-friendly and efficient solution to commute and increasing fuel costs drive the growth of the global electric bikes market. In addition, growing interest in cycling as a fitness and recreational activity has driven a paradigm shift in fitness-conscious customers, because riding the electric bike helps to travel longer distances with the same amount of peddling. Also, cycling is a healthy and low-impact activity having many physical and mental health benefits, such as building endurance, alleviating stress, enhancing muscle strength, and burgeoning the cardiovascular fitness population across the globe. The North American electric bikes market is projected to witness the fastest growth during the forecast period, owing to growing adoption of electric bikes for daily commute, recreation, and fitness activities. However, several aspects, such as high cost of e-bikes and ban on use of e-bikes in major cities in China, are projected to hamper the growth of the electric bikes market during the forecast period. Although, increase in investments in R&D activities to improve battery performance and improve bicycling infrastructure is expected to pose lucrative opportunities in the upcoming years. 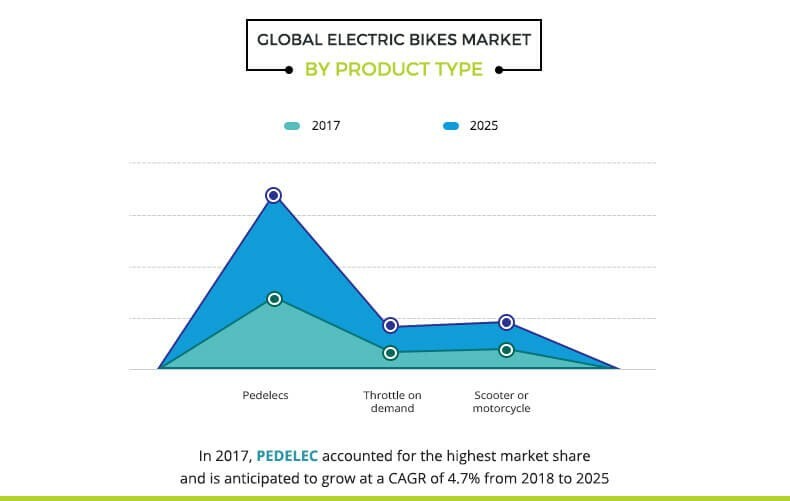 The global electric bikes market by product type has been segmented into pedelecs, throttle on demand, and scooter & motorcycle. The market is dominated by the pedelecs segment, owing to its high adoption for commute globally. This segment comprises pedelec and speed pedelec e-bikes based on their power assistance and speed difference. The electric bikes market by drive mechanism has been segmented into hub motor, mid drive, and others. The hub motor is the most-widely used drive mechanism in which either of the wheel is replaced with one having a hub motor connected by a wire to a battery or motor controller. 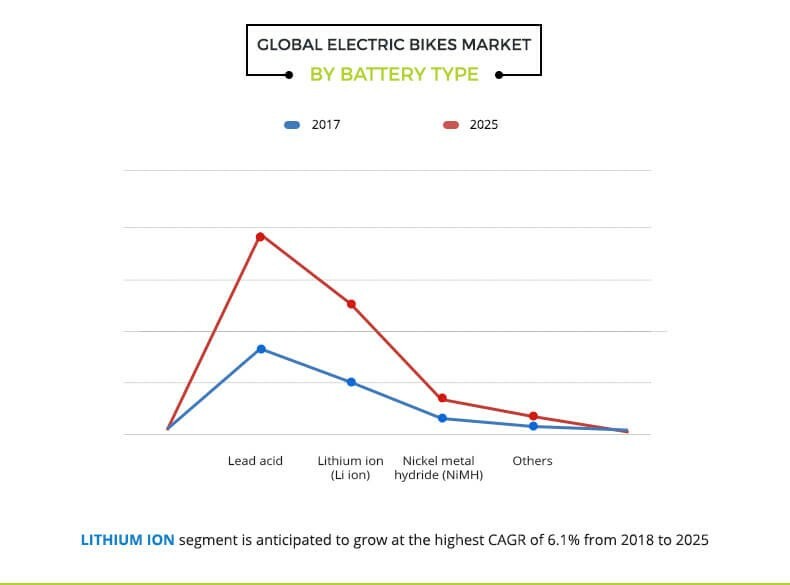 The global electric bikes market by battery type is segmented into Lead-acid, Lithium-ion (Li-ion), Nickel-metal hydride (NiMh), and others. The lead acid segment dominates the global market, owing to its low cost and ease of recycling. However, the popularity of Lithium-ion batteries has been rising exponentially, attributed to their light weight and high capacity. The global electric bikes market by region has been analyzed across North America, Europe, Asia-Pacific, and LAMEA. The Asia-Pacific region dominates the global market but is anticipated to witness a low growth rate during the forecast period, because of the ban on electric bikes in some major cities of China. The European region is anticipated to witness a significant demand, however, in North America, the electric bikes market is anticipated to grow at the highest CAGR throughout the forecast period. The LAMEA region is also anticipated to witness a notable growth, owing to rise in awareness about eco-friendly products. 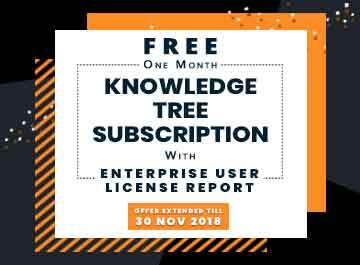 The key market players and their strategies are profiled and analyzed thoroughly, which predict the competitive outlook of the market. 8.5. Giant Manufacturing Co., Ltd.
8.6. Jiangsu xinri e-vehicle co., ltd.
Electric bikes are bicycles with an integrated electric motor drive mechanism and battery, which produces power to assist or cause propulsion. Various kinds of e-bikes are available globally. These range from electric bikes with a small motor to assist the pedal-power of the rider to more powerful e-bikes that produce power to completely drive the bike using throttle. The key benefits of electric bikes are additional power for long distance commute at higher speeds, a better time usage, ability to shoulder additional cargo, and economy as compared to the other modes of transport. The global electric bikes industry growth is expected to witness a robust growth during the forecast period. This is attributed to rising government support, intensifying sterner rules in favor of electric bikes, growing consumer inclination towards use of e-bikes as an eco-friendly and efficient solution for commute, and increasing fuel costs. Further, growing interest in cycling as a fitness and recreational activity drives the growth of the electric bikes market. Improving bicycling infrastructure and battery technology is expected to offer opportunities for growth of the electric bikes market during the forecast period.